From a very early age, Brittnie’s primary responsibility was caring for her brother who has cerebral palsy and developmental delay, whilst trying to keep up with her schooling. When her mother’s alcohol addiction spiralled Brittnie and her brother went to live with her nan and aunty. Kids Under Cover inst alled a two-bedroom studio for Brittnie and Jesse in April 2009. In the years following Brittnie received Kids Under Cover scholarships to help with the costs associated with years 10 and 11 and finishing year 12. Brittnie says she probably wouldn’t have done her VCE if it weren’t for the help of her scholarships. Brittnie was announced the winner of the inaugural Ken & Lenka Morgan Scholarship for the 2014 school year. Brittnie used the funds from the scholarship to pay for her attendance at a two-day conference “Happiness and it’s Causes” and enrolled in a 12-week educational program. She also was able to pay for driving lessons so she could attain her driver’s license. Since then Brittnie has gained a Diploma of Nursing and has been working in aged care for three years. Having started out as a personal care assistant, Brittnie is now working as an enrolled endorsed nurse and loving it. She now lives with her long-time partner and is saving to buy a brand-new car. Determined to continue to grow both professionally and personally, Brittnie works hard to support her dreams. 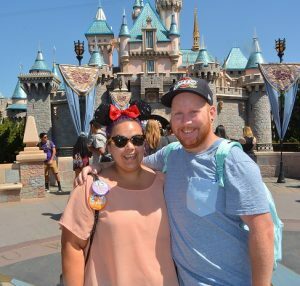 “I’ve just got back from three weeks in the US where I visited Las Vegas and New York, spent my birthday at Disneyland and took a helicopter flight over the Grand Canyon. Now that Brittnie is back from her “trip of a lifetime” she is focussing on her plans for the future. 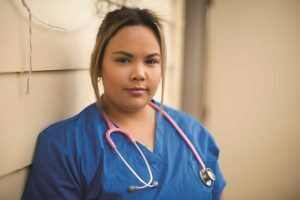 “I am about to start the application process to enrol in a Bachelor of Nursing for 2018. Brittnie is a wonderful example of how stable, secure accommodation coupled with financial support for education can provide the foundations for a bright future.